Among those big things the Governor identified was securing the State’s water future. Specifically, Governor Ducey called on lawmakers and stakeholders to take action on protecting the State’s Colorado River water supplies. “We cannot kick the can any further,” he said. Our duty is to leave this state in far better shape than we found it — and we are well on our way. These are the tasks before us. And if there’s any question of how Arizonans expect us to solve these problems, I’d say, look around. Taking the oath with me today are Republicans and Democrats – all hired by the same electorate. When conversations stall, as they sometimes do during difficult discussions, we let history be our guide and the hand that lifts us back up. 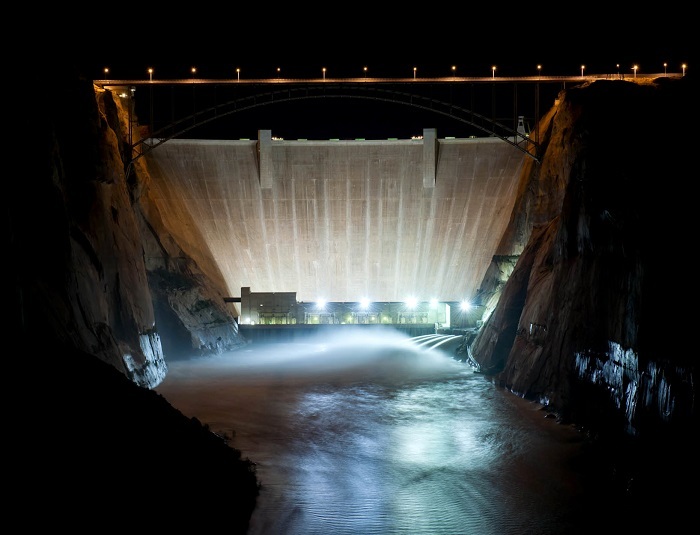 Nearly four decades ago, in 1980, Arizona’s accelerated water consumption forced a sobering ultimatum from the federal government: reform or suffer severe water cutbacks. The can could not be kicked any further. But Arizona’s history is not one of missed opportunities or efforts that came up short. Rather we find, that in the darkest times, Arizona’s pioneering spirit shines the brightest. Democrats and Republicans rose above party labels. They brought skeptical and reluctant stakeholders to the table. And they acted – and they did it with good faith and honest intentions. For the people in this crowd and many across our state, I don’t have to spell out the parallel circumstances in which we find ourselves today. It’s simple. 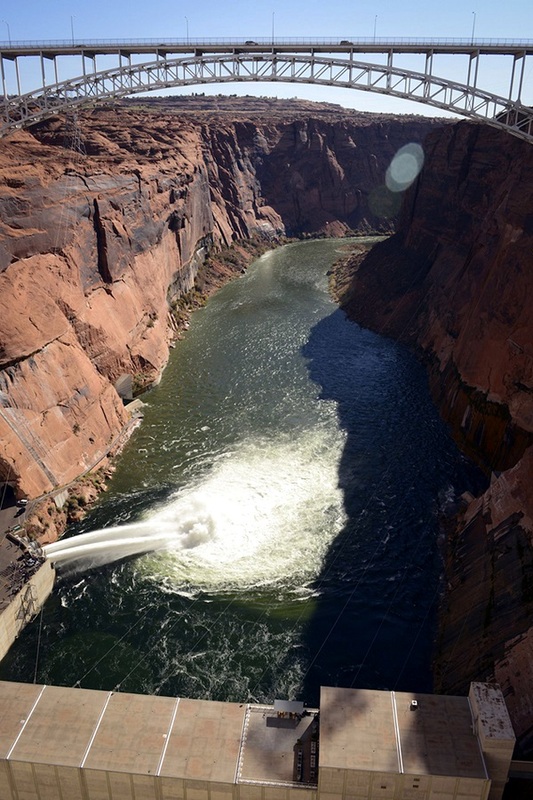 Arizona and our neighboring states draw more water from the Colorado River than mother nature puts back. And with a critical shortfall imminent, we cannot kick the can any further. It’s going to mean rising above self-interest, and doing the right thing. It means taking the action our past and future generations demand. PHOENIX – Beginning the week of December 10, 2018, and continuing approximately through the end of January 2019, the Arizona Department of Water Resources (ADWR) will be conducting an extensive effort to measure water levels in wells in the Pinal Active Management Area (AMA). water resource planning and management. Every year the Department’s hydrologists collect water levels in a statewide network of about 1,600 to 1,800 “index” wells that have typically been measured annually over the last several decades. Also each year, the Department targets at least one area of the State for a more intensive “sweep,” which provides a deeper dive into regional groundwater conditions. The involvement of well owners in sweeps is entirely voluntary. ADWR greatly appreciates the cooperation of well owners who participate in the well survey. Since the dawn of modern science – since Copernicus struggled to bring around 16th century skeptics to his evidence of a heliocentric solar system – illustrating complex science to a general audience has proved challenging. A century or so after Copernicus, Galileo and his famous telescope would (eventually, at least) help illustrate the Polish astronomer’s claim that the earth revolved around the sun, as opposed to the other way around. Proving, in other words, that images matter. Text is good. Text and way-cool images? Even better. 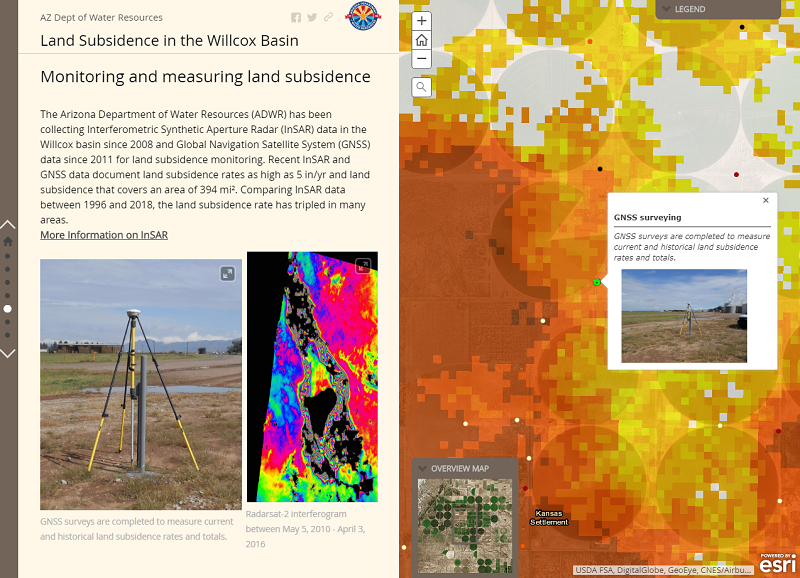 A “story map” depicting land subsidence in the Willcox Groundwater Basin, where ADWR recently completed work on a comprehensive groundwater-flow model. 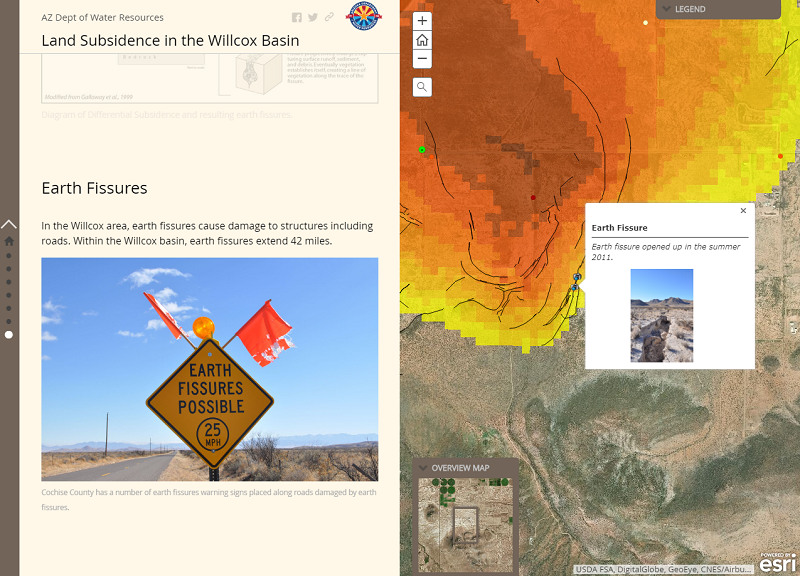 Focusing on the prevalence of land subsidence in the Willcox Basin, the story map uses interactive imagery as a compliment to textual descriptions of the area’s subsidence issues. Together, they paint (quite literally) a clear picture of the dramatic subsidence issues facing the region. Produced for ADWR by GIS Application Developer Karen Fisher and Brian Conway, supervisor of the Geophysics/Surveying Unit, the “story map” brings together into a single, user-friendly package a wide assortment of the tools that hydrologists employ to analyze groundwater conditions. “This story map is the first of hopefully other story maps that combine (geographic information system, or “GIS”) maps, data analysis, images/multimedia content, and a summary of various Water Resources topics in an easy to read format to tell a story,” said Conway. Fisher designed the story map using ArcGIS mapping and analytics software, a product of Esri, a global market leader in GIS. “Esri has story-map templates that they have been encouraging their users to use,” said Fisher. The narrative text is the other beauty of the ADWR land-subsidence story map. Its text is general-audience friendly – scientifically precise while, at the same time, expressing the complex land-subsidence issues the map depicts clearly enough for a high-school age, would-be hydrologist to appreciate. The most visually stunning image of the C.C. Cragin Reservoir nestled within the deep canyons of the Mogollon Plateau uplands is that of the dense forests surrounding the picturesque man-made lake. For the people charged with maintaining the reservoir – now a vital source of water for the city of Payson – the handsome forests are not a pretty sight. “The threat of wildfire to our forests is real,” said Stephen Flora, a senior hydrologist for the Salt River Project during one of the “Water 101” series of presentations sponsored by the Arizona Department of Water Resources. SRP manages the C.C. Cragin Reservoir on behalf of Paysonand other Rim communities that expect to rely on the 15,000-acre-foot facility. As recently as May 2018, the “Tinder Fire” burned more than 12,000 woodland acres near the reservoir. The two phenomenon – forested Arizona mountain watersheds and the mostly winter runoff that provides much of central Arizona’s water supplies – are intrinsically linked. SRP is a primary water provider for much of central Arizona. As Flora illustrated with his presentation, the majority of SRP’s watershed is covered in dense forest land, which in the course of the lengthy Southwestern drought has become increasingly susceptible to destructive, crown-topping wildfires. 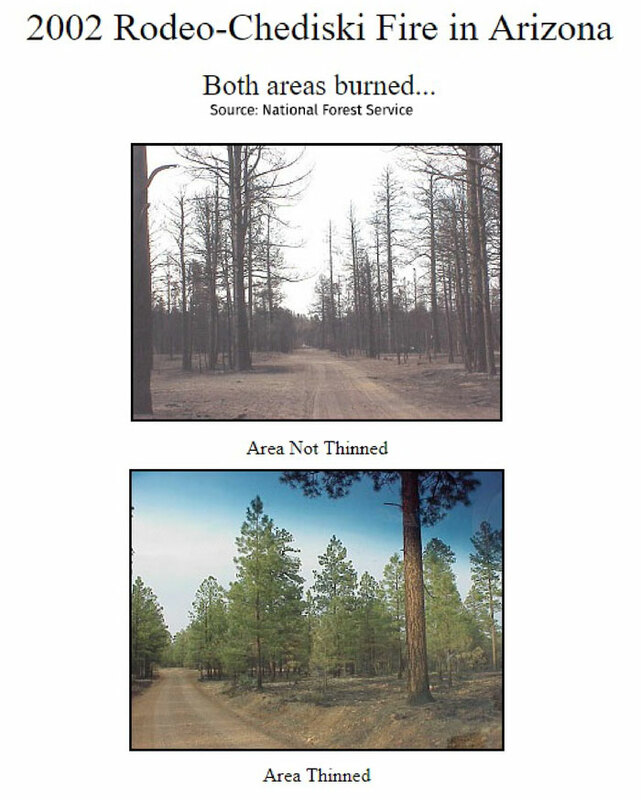 Two mega-fires alone – the 2002 Rodeo-Chediski Fire and the 2011 Wallow Fire – consumed nearly 1 million acres of mostly Ponderosa pine forestland. Flora noted two big efforts now under way to mitigate the potential for wildfire in critical areas of the eastern mountains of Arizona. Both efforts involve thinning dense forestland such as that surrounding the C.C. Cragin Reservoir to so-called “pre-Columbian” densities. Forests that prior to the 19th century may have had as few as 30 to 50 pine trees per acre today often have up to 1,000 trees per acre. That tree density saps the moisture from the soil and leaves the dense stands of trees more vulnerable to wildfire. 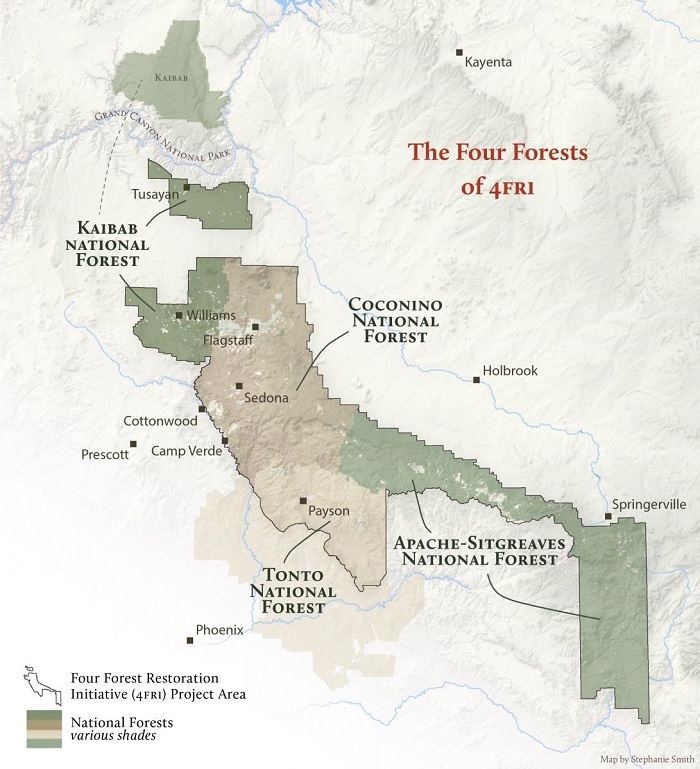 One of those efforts that Flora described is the Four Forest Restoration Initiative, or “4FRI,” an ambitious forest-restoration project that includes forested lands in the Kaibab, Coconino, Apache-Sitgreaves and Tonto national forests. Including 2.4 million acres overall, 4FRI is considered one of the biggest forest restoration projects ever undertaken in the United States.. While it enjoys wide support, 4FRI has been hampered over the years by technical, environmental and economic challenges. “Treatment (of the forest) has been very slow,” said Flora. The other major effort is focused in the 64,000 woodland acres surrounding the C.C. Cragin Reservoir. 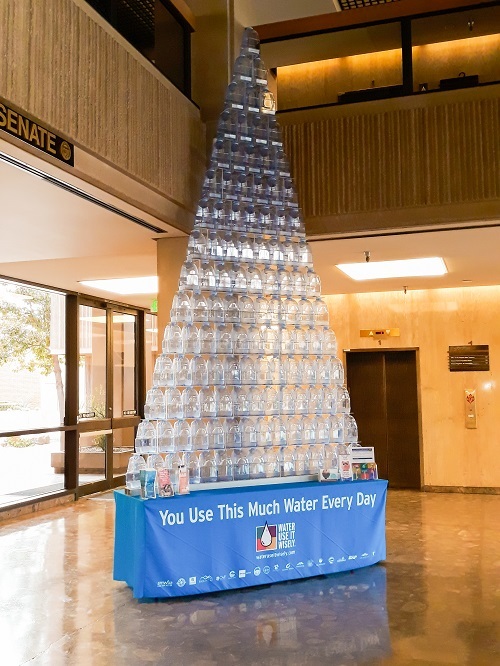 The Forest Service announced in September its plans to take action to protect the Payson water supplies with a thinning project anticipated to take five years or more. “We have a need for larger efforts to reduce the risk of fire,” said Flora.